Birmingham is the biggest British city outside of London, with a population of around 1.1million. It is also the youngest city in Europe, with nearly 40% of residents being under 25. In addition, there is a rich cultural mix in the city, with almost one third of residents from an ethnic minority background. Birmingham has 56 kilometres of canals (that’s more than Venice) and over 8,000 acres of parks and open space. This makes Birmingham one of the greenest cities in the UK. 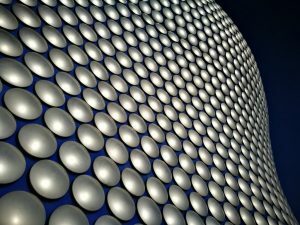 For over 250 years Birmingham’s Jewellery Quarter has been at the heart of jewellery design, and still today produces an estimated 40% of all UK jewellery. And let’s not forget chocolate, with the suburb of Bournville still home to Cadbury’s. You can smell it in the air! Birmingham Hippodrome theatre is the busiest in the UK, welcoming over 520,000 visitors each year and more people watch the world famous City of Birmingham Symphony Orchestra (CBSO) every year than any other UK orchestra. Birmingham also has more Michelin-starred restaurants than any other English city outside London. We will show you the best walk, run and cycle routes of Birmingham! Just click on one of the logos for Birmingham Walking, Running or Cycling routes.